"We've got a modded one which is really, really wide and out of tune. Then we've got a classic. The mod on the first CE-2 is literally just to widen the sweep. So you get a really almost Leslie-like out-of-tune for the wobble to that. The right hand of those CE-2s just has a very warm, I guess you might almost say a slightly 80s sounding chorus on it. Then people will hear that and say, 'Oh that's a sound I know'," says Josh Klinghoffer's guitar tech about the Boss CE-2 Chorus Guitar Effect Pedal. "Live in Barcelona, 1985. Fender Silverface Twin Reverb and JC-120. Note Boss CE-2 on top of Twin." 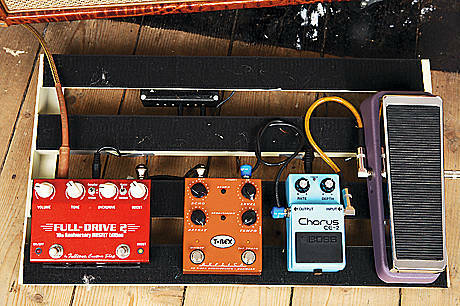 According to Pete Cornish's website, Boss CE-2 chorus pedal is a part of his pretty massive pedalboard. 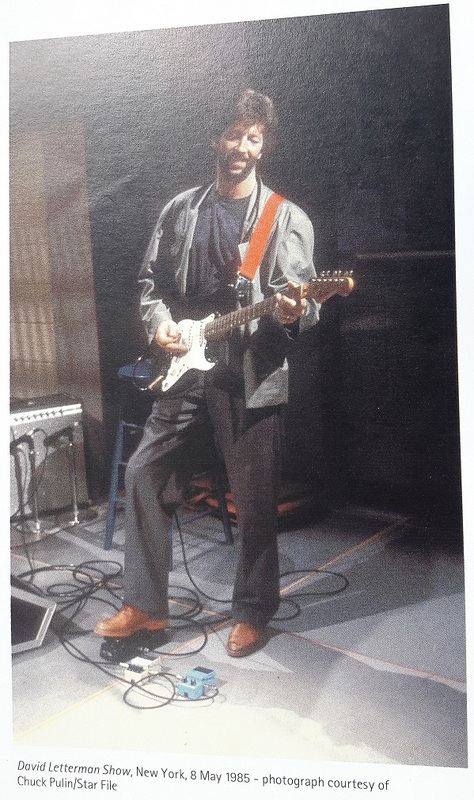 In this 1985 photograph of Eric Clapton playing his "Blackie" Fender Stratocaster on the late-night talk show "Late Night with David Letterman", it can be seen that the british rock musician uses the Boss DD-2 Delay effect (introduced in 1983) as well as a Cry Baby wah wah pedal and the Boss CE-2 Chorus stomp box. This picture by Chuck Pulin of Star File was taken from the 2004 Christie's auction catalogue for the sale "Crossroads Guitar Auction - Eric Clapton and Friends for the Crossroads Centre", page 194. Here you can see that Carlos Santana is using a Boss CE-2 Chorus. 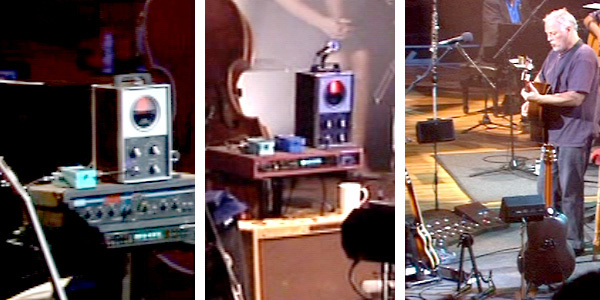 This small light-blue pedal can be seen on top of some of David's equipment in the first two photos of his 2001-2002 concert setup. Used extensively throughout the 80's and 90's. Also used in solo shows when doing more recent Floyd tunes. In this video, Gary featured a selection of Boss guitar effects pedals he uses including the [DS-1](http://equipboard.com/items/boss-ds-1-distortion-guitar-effects-pedal), CE-2, [DM-2](http://equipboard.com/items/boss-dm-2-analog-delay-effects-pedal), [OC-2](http://equipboard.com/items/boss-oc-2-octave-pedal) as well as the [BF-2 Flanger](http://equipboard.com/items/boss-bf-2). At 5:21 in this "Rig Rundown" with *Premier Guitar" Johnny says about this peal, "This is a chorus, a Boss Chorus pedal - It's a little fuller, it adds a little depth." In the [accompanying article](http://www.premierguitar.com/articles/16737) "*Premier*" writes "Winter uses a [Music Man 410 120-watt combo](http://equipboard.com/items/1970s-music-man-410-120-watt-combo-amp), which has been his amp of choice since the late '70s. He sets it with the bass and mids dialed completely out so it's all treble. The Boss CE-2 Chorus is kept on all night to add depth to his tone." A CE-2 can be seen in Hillel's pedalboard from 17 seconds onward in the video. At 2:02 in this video, Brad Whitford's Boss CE-2 Chrous pedal can be seen. This site shows photos of Rourke's Boss CE-2 Chorus Pedal atop his amp. The blue CE-2 or CE-2w can be seen on his pedalboard, first one on the left on 24:10 and 43:55 on this video: https://youtu.be/FhsX0DHM3dM?t=43m55s https://youtu.be/FhsX0DHM3dM?t=24m9s as well as on this concert on 13:13 min: https://www.facebook.com/Billboard/videos/10156373810574581/UzpfSTExNTc2MjEzMDg6MTAyMTQ3MzM3ODU0NzU3NDI/ Print screens here: https://imgur.com/a/vYxke https://imgur.com/a/JKzIt https://imgur.com/a/3uMII https://imgur.com/a/Jvsev He speaks about that the earlier sound of The Cult that was based on the Roland JC-120 chorus here: https://youtu.be/5_qxW_htSnU?t=14m20s . I saw them live in 2017 and was dissapointed to see there was JC-120 lacking from his amps, only Marhsalls and Vox AC30. This could be the reason he has CE-2 on his pedalboard. It's either CE-2 or CE-2w, I can't see it that up close in this video. Next to the Boss GE-7, the Boss CE-2 chorus pedal is visible. In this photo, Boss CE-2 is visible next to Thayil. "I saw a picture of your pedalboard. You’ve got a bunch of BOSS pedals, including a CE-2 Chorus. Yeah, the light blue one. I love that pedal. It’s got the two knobs on it. That one’s straight off my high school pedalboard." 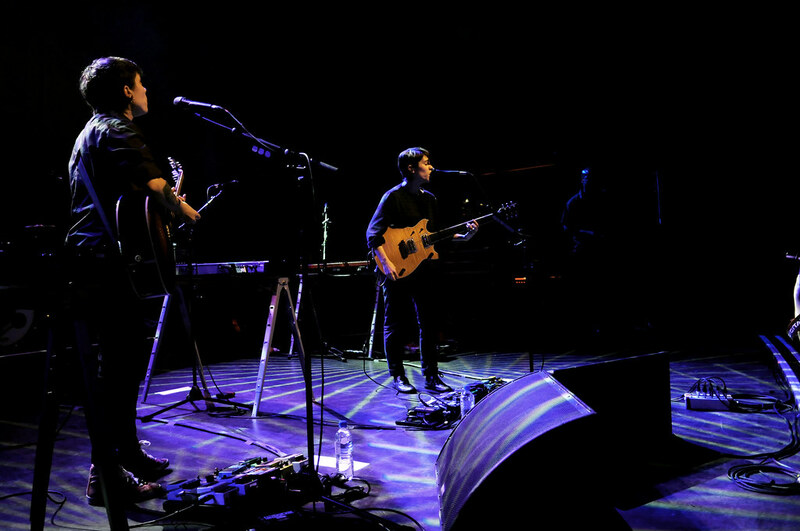 [*Mix Online*](http://www.mixonline.com/news/tours/all-access-tegan-and-sara/368190) writes that Tegan uses a Boss CE-2 Chorus Guitar Effect Pedal. At 32:16 you can see the blue pedal. You can also recognize this pedal because it has only 2 knobs. Clark used a CE-2 on songs off the album "Hysteria", such as the title track, and "Love Bites"
Occasionally, John Scofield uses a Boss Chorus pedal that’s been modified to be true bypass. “I turn it up all the way and played this kind of fake Leslie sound. It's just another vibrating device,” (5:49). After the wah, Bortnick’s sound goes through the, “to Boss CE-2 Chorus Pedal. Kinda’ set to the "Sco" sound... cause you know there's a couple of instants, where I'm emulating something he did in demo or on the record,” (19:10). At 9:11 in this Rig Rundown for G.E. Smith of [Moonalice](http://equipboard.com/band/moonalice), [Saturday Night Live Band](http://equipboard.com/band/saturday-night-live-band), [Hot Tuna](http://equipboard.com/band/hot-tuna), and [Hall& Oates](http://equipboard.com/band/hall-oates), displayed is a Boss CE-2 Chorus Guitar Effect Pedal. At 11:17 of this video, you can see Dan using the Boss CE-2 chorus. It is distinguished by the 2 knobs (the CE-3 has 3 knobs) and the single output jack (the CE-2W has dual outputs). This pedal can be seen at the end of his chain in this video. In [this](http://www.guitargeek.com/tim-mahoney-311-guitar-rig-and-gear-setup-2009/) Guitar Geek rig diagram, Tim's Boss CE-2 can be seen. In this photo [(source)](http://www.kulick.net/blog/index.shtml#day49), Boss CE-2 chorus pedal is visible. 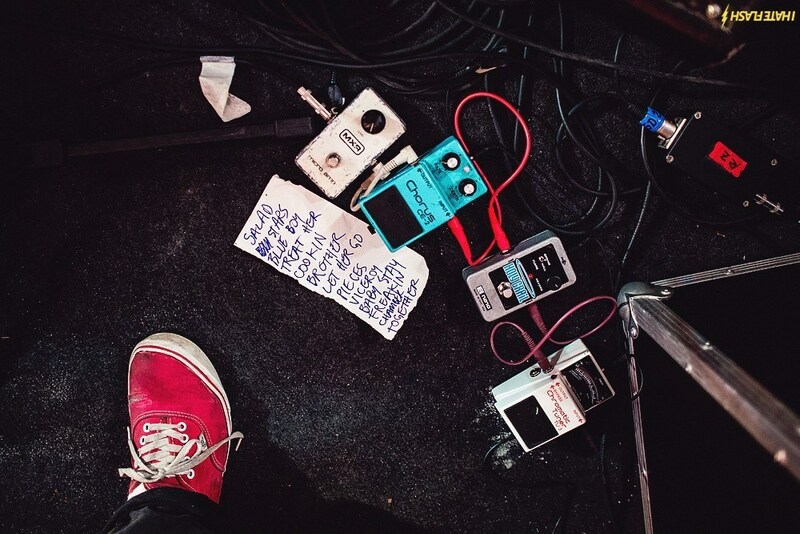 In this photo of Mac's setlist and pedals, it can be seen that he uses a Boss CE-2 Chorus. "And I am also using the original BOSS chorus pedal, you know the one with just two knobs only (note: the Boss Chorus CE-2)." "It was when I was nine years old, which is when I first started playing guitar. One of the first things I did was get a stompbox, and it was a BOSS Super Overdrive. In fact, it’s the same one in the picture [above], which is why it’s missing a knob and all banged up. I’m 34 now, so I’ve had that pedal for 25 years. My second pedal was a BOSS CE-2 Chorus, and then I got a BOSS phaser and delay. I became a huge BOSS fan." Trace your signal from the guitar to the amp. It goes through three **Boss** pedals – the little ones that have got noiseless switches. They come in pretty colors. I’ve got a blue one, a green one [laughs]. I’ve got a **chorus**, an overdrive, and a compressor. I don’t have a harmonizer, but I think I’ll get one. I think I’ll try one onstage. Pete, the bass player, uses one. And then I go right to the amps. I’ve got three 100-watt Marshalls and three 4×12 cabs, but two of those are spare, I think. I just go through the one. They mike that, and what happens is, I always play with the guitar flat-out, and I set the level as it would be for a loud rhythm sound. And then if it comes to showing off and doing a solo, I just flip on an overdrive. That’s how I like to work it. I like a really loud rhythm sound. At first second of the clip there are 2 amps and a pedalboard. The second pedal from the left is clearly Boss CE-2. Blackie told me that he uses an "old boss chorus" for Nunchukka Superfly shows. Managed to find a photo that shows its a Boss CE-2. In this photo of his new "GigRig" pedalboard, one of the pedals that can be seen is the Boss CE-2 chorus pedal. 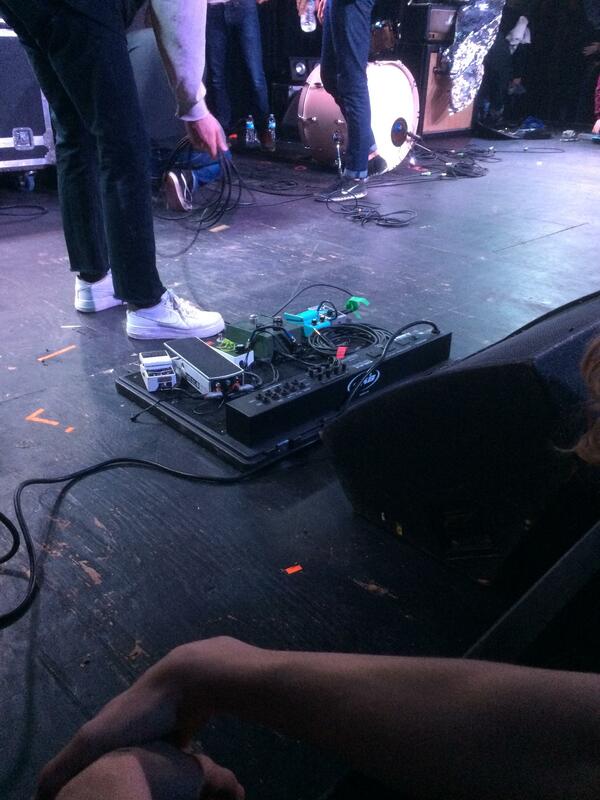 (2:36) "Tengo un Chorus Boss, el CE-2"
Miranda posted a photo of her pedal board on her Tumblr. Minute 1:15: we can see the Boss CE-2 Chorus Guitar Effect Pedal in Julia's Pedalboard. This has been on Nathan's board since late 2014. A Boss Ce-2 can be seen at Peter's feet at 3:19 in the video. In this batch of pedals, one of the pedals visible is the Boss CE-2 chorus pedal. The XTDP website features [a brief interview/quote from Julian](http://extendplay.blogspot.com/2013/04/kitchens-of-distinction.html) wherein he reveals some of the gear used during KoD's heyday. Among his pedals, he lists a CE-2. 'Miki uses BOSS effects' - insert box in this Making Music article. According to [this interview with Reverb.com](https://reverb.com/news/drab-majesty-talks-chorus-pedals-casio-synths-and-the-selfless-act-of-songwriting), Andrew Clinco (alias DM) uses a CE-2. One of the pedals in all Boss pedalboard. At 2:58 in the Youtube video Finn's entire pedalboard is visible including his Boss CE-2 Chorus. It can be heard used in this cover of Spiders. "And then this happened. #npd"
An original CE-2 from the 80's that Domhnaill nicked from his dad because he never used it. Domhnaill uses it to get those Mac DeMarco tones he strives to emulate in "I'm So Blue". Mowa o tym 7 minucie. This is from a picture of Jun's pedal board on his twitter. I bought my Boss CE-2 used, and it definitely looked well-loved. My version is the most vintage (and perhaps most coveted) version, with the Japanese black label (these were made in the late 70s/early 80s). It just sounds terrific, and easily recalls chorus tones of yesteryear, from the lush chorused guitars on Crowded House's "Don't Dream It's Over" to the subtle jangle on The Smiths' "This Charming Man", this chorus does it all. Needless, to say this pedal is a legend in its own right, and a must-have for any chorus lovers/vintage pedal collectors/anyone. This was my first pedal received as a Christmas present. Originally I didn't use this much until I started hearing it more as a subtle effect used by the Police, the Cure (all 80s sounding bands) but also more modern bands such as RHCP, Incubus etc I use this mainly to wash up the sound although it's cool when combined with an extreme amount of feedback. Amazing chorus you can't find in a modern pedal! David added two of these CE-2's in his rig to add more depth to his overall Wall sound. There are two versions of these, one with the model number (CE-2) starting from the "r" under CHORUS, and the other starting from under the "U". I have two if the former versions. They have a warmer, deeper sound than the latter. I've reached the end of my little chorus trip for that perfect 80s / 90s tone by getting this CE-2. I have quite early one, 1983 from Japan (Black Label) with MN3002 chip. Funny how two controls are enough to get that perfect tone which cannot simply be described in any words here. You need to hear it to understand why some many people hype about CE-2. Sounds just astonishing on cleans, kicks a** on dirts. Do not bother about CH-1, CE-5, Small Clone, MXRs etc - just get CE-2, period. I bought one too and remember how "perfect" the tone itself was. Not even considering the low price I paid for the pedal, I immediately recognized that it was one of the best gear I had ever purchased. However, as far as the chorus journey goes, I didn't realize there was more ground to cover until I heard the CE-1. My ce-2 is MIT green label. It sounds delightfully! Always been the best sounding Chorus ever - only critique is a slight volume boost once engaged but hey we should not complain its better than a drop in volume.My one has been modde with the monte allums kit - faster rate and a few upgrades in op amps etc- great but emphasises the volume boost even more. Best chorus pedal ever, there is a lot of depth in this little box and it is just perfect. This is absolutely my favorite purchase of the last few years or so. Found a used one from '85. Simply the best sounding Chorus money can buy. the best chorus ever made. No longer use it on my board but it is the best chorus I have ever owned. Nothing sounds as lush and rich. Creamy and Great pedal ! Meat with potatoes chorus. Instant classic... sound very 80's. This is the one chorus sound that doesn't make me cringe. The LED light doesn't work but that doesn't mean much to me. Mine is late 80s but even today sounds awesome. Great unit. I have a DIY Chorral Chorus, wich is based on (replica of) this unit, but it sounds amazing. yeah, the CE2 is pretty badass.... its no CE1, but its close enough for live, though I wish it had stereo.... it seems like every modulation effect I've ever owned is mono and then when I score a stereo one it sounds inferior so I get rid of it and swear off chorus and flange again.... CE2, mono.... CS9, mono... FL9, mono, BF2, mono... small clone, mono.... smalls tone, mono! it goes on and on.... but I like using 2 amps and would totally dig on spreading my modulation across both. lif is really unfair man. Boss took the CE-1 and converted it into a small stomp box with improved functionality. The CE-2 captures the analog chorus sound of the 80s and I always laugh at people paying ridiculous sums of money for boutique chorus pedals that aim to mimic the early Boss pedals. Folks, the CE-2 can be had for $200 or less. There's no reason to spend more (or less) on another chorus- that is, except the Boss CE-1. The reason that I'm giving the CE-2 4 stars/5 is that I can't give it 4.5 stars; the reason I'm not giving it 5 stars is that it doesn't capture the "depth" element of tone that the CE-1 originally had. However, the CE-1 can be pricey, and while I'd argue that the depth is worth the extra money, the CE-2 is hands down the best chorus for the money.